Almost resembling a tree stump, this one-of-a-kind end table is a lovely, industrial accent. The cream-colored vellum tabletop provides the perfect surface to display everything from lamps to magazines. 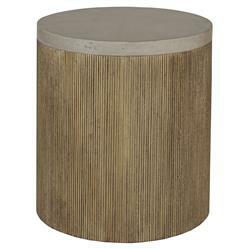 With a base crafted from resin in an antique gold finish, this accent table exudes a natural, artistic, elegant appeal.